I’ve been interested in electronics/communications ever since I could understand the Radio shack catalog. I started off with talking to friends on the CB when I was around 13 (1996). My uncle Don (N1JOI, SK) caught wind of my CB hobby and pushed me to get my Ham Radio license. I sat with him and he tried to teach me and he also enrolled me in a class at the local hospital in 1998 that was taught by James Mullen (KK1W). 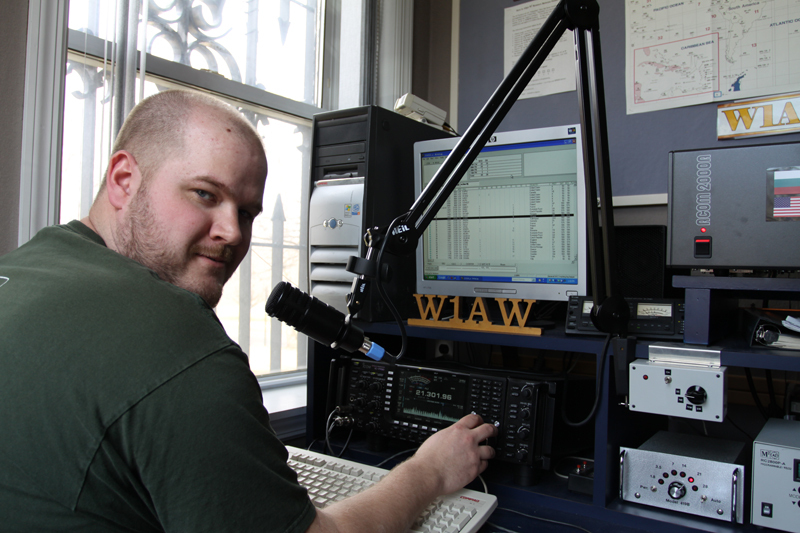 Being a teenager took over and I lost interest in Ham Radio until my senior year of High School. In 2001, I obtained my Tech License after 2 other attempts and joined the MTARA (Local repeater club). After a couple of years of being involved with Ham radio I once again lost interest. Within the past couple of years, I purchased a house, got married and I now have two kids. So I’ve been finding my self home a lot more and figured to get back into Ham radio since it’s a hobby that can be done in the house (Compared to my Photography and Motorcycle hobbies). This time I didn’t want to just buy a dual band rig (144/440) and talk on repeaters. I wanted to operate HF, So I studied and Obtained my General license in June of 2010. Now that I have HF privileges, You will find me mostly doing Digital communications (PSK, RTTY, HELL, JT65) and making SSB contacts with DX Stations. I find it hard to Rag Chew on HF as I do not know the person or their environment. It gets boring talking about the weather and “What equipment are you running?”. But if the moment is right, I will ragchew. In 2011 I set a goal to get my extra class license before field day. I decided to start studying in mid May and on May 27th, I passed my extra class. Another goal was to become a ARRL VE (Volunteer examiner) which I obtained VE Status in April 2011. So far participated in one session. I hope to participate in more. The next two goals I’m still working on is installing a ButterNut HF9V that I obtained in the winter at a ham fest. The other goal I am working on is to “Master” CW (Morse Code) at 20 WPM. With the way things are, I don’t think that will happen any time soon. So if you catch me on CW, give me break. In November 2011, I decided to change my call from N1BMX to something else. For the past couple years, I was no longer liking the N1BMX call for various reasons. I applied for 1X2 calls here and there but lost because of competition. When N1DE became available, I decided that no matter what I want to change my call so I applied for N1DE and another call that has been in system for quite some time knowing that my chances are better. I ended up losing out on N1DE but got NT1K. Now I have to get used to saying “November Tango One Kilo”. I started N1BMX.com as a way to tell others what I’ve been doing in the “Radio” world. I am by no means an Expert” on anything I type about. Please keep that in mind when browsing this site. I like to report on things that I’ve seen or done from my point of view and hope that at least a couple of people find it useful. I’m open to comments or criticism, but keep in mind that I’m new to a lot of this stuff. If you didn’t tell by now, I am HORRIBLE at grammar. I am not the best at spelling (even with autocheck) and I’m just as bad at forming sentences and paragraphs. This is just a blog, not a professional website. So please do not remind me about it, I know. Since I changed my callsign, N1BMX.com no longer seems logical so I moved everything to NT1K.com as well as my e-mail addresses. If you do leave this site with anything useful, let me know! That way I know that at least someone is reading this site. Simply to cover my hosting fees. I do not ever plan to ever make money off this website. The revenue from banner ads on this website goes to paying VPS and domain fees. Seems like stealing work or lifting whole websites has no bounds. Sorry to learn about qrznow’s lack of professionalism. Don’t feel like the lone ranger, however. I ran the successful Vanity HQ for 14 years. RadioQTH did the same to me by copying my work, almost word-for-word. They even copied the wording on the call sign certificate generator. It’s difficult to correct or prevent the wrongdoers. Best to you. I have seen your comment about my realization of your OSJ antenna. Thank you for the citation. greeting from Perth, Western Australia. I have read with very much interest (and watched the video) your post about the making of the OSJ J-pole antenna. I need to build one for 77.400 Mhz. Why? Because I’ve got a transmitter license for that frequency. Here in AU that frequency is used for “narrowcasting”, that is, FM radio services of restricted interest (in my case, disco music from the 80s and the 90s, as I love that). I do it for fun; I am a HAM myself (VK6FMOL) and like you I have a strong passion for all electronics and radio. Like you, I did CBs in my teens, then life “distracted me”, and now I am back in the hobby, only this time I’ll stay in it. Your doing some real good things and people like you keep the hobby alive. Some time ago I followed your Arduino morse code beacon project, good for Fox Hunt.